"The City of Omro's Parks Committee is dedicated to provide a park and recreation system that will meet the needs of our current and future generations, preserve and protect the city's open space, water, historical, natural and economic resources; and provide a park and recreation program that is designed to enhance the community's economy and quality of life." Well over 100 acres of land are currently available for outdoor recreational activities in Omro. The city maintains about 46.43 acres, 41.18 of which is designated as parkland; the Omro School District 99.5 acres; and the private sector 42.4 acres. Parks in Omro are relatively small; Miller Park and Fox & Hounds Park are teh only ones which exceed 10 acres. About 40 acres of the Omro High School / Middle School complex is currently developed with recreational facilities. The site's 97 acres provides ample area for future recreational development. The Parks Committee meets as needed throughout the year to conduct oversight and planning for our city parks. Parks Committee meetings are open to the public. Omro's dominant natural feature, and its most important natural asset, is the Fox River, which flows in an easterly direction through the city. Omro's business district and about 75% of its residents are located south of the river. 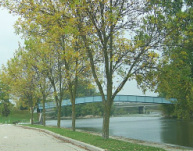 The Fox River is a major barrier, averaging 200 to 300 feet in width. It is spanned by only one vehicular bridge within the city limits, which carries traffic from State Highway 21 and 116. The old highway bridge has been the the access to the heart of the business district. Recent efforts to obtain designation of the Fox River as an American Heritage River and earlier effots to create teh Fox-Wisconsin Heritage Corridor, provided increased opportunities to develop the river's potential as a recreational and economic resource. Click here to view the GIS map of the plan.